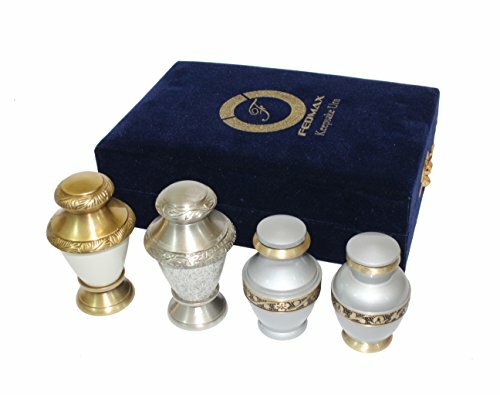 Keepsake Cremation Urns, (White 4pc), Small Funeral Urns for Human Ashes w/Velvet Box, by Fedmax. Handcrafted with fine detailing. There are 4 different White keepsake cremation urns made with Brass detailing and a polished finish. Sturdy and solid design casted from thick Brass to give each small funeral urn a solid feel. Provides a reliable and secure seal that will keep your loved ones ashes stored inside the container even if it is dropped. For protection and preservation of the exterior of each urn, the included blue velver and satin interior box protects each keepsake urn from scratches and damage. Each small urn holds around 3 table spoons of ash to allow you to gift the keepsake to friends or family. We are so confident that our product is the best on the market that we offer a no hassle money back guarantee. HIGH QUALITY | EACH URN IS UNIQUE - Handcrafted with fine detailing. There are 4 different White keepsake cremation urns made with Brass detailing and a polished finish. SCREW-TOP LID - Provides a reliable and secure seal that will keep your loved ones ashes stored inside the container even if it is dropped. INCLUDES SATIN AND VELVET BOX - For protection and preservation of the exterior of each urn, the included blue velver and satin interior box protects each keepsake urn from scratches and damage. PERFECT FOR GIVING TO LOVED ONES - Each small urn holds around 3 table spoons of ash to allow you to gift the keepsake to friends or family. If you have any questions about this product by Fedmax, contact us by completing and submitting the form below. If you are looking for a specif part number, please include it with your message.